Men are dumb enough to try things that women often wouldn’t. 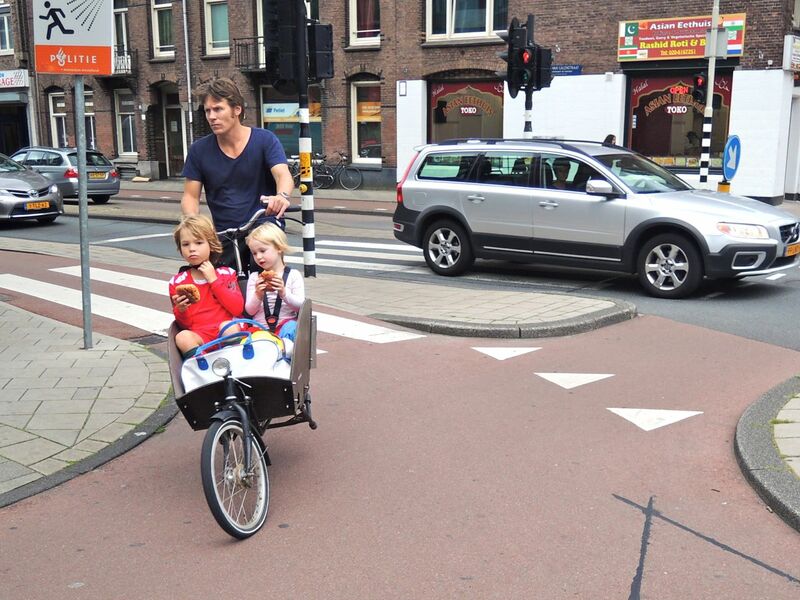 Load two kids on a regular bike, grab some groceries, and go to the park: no problem. 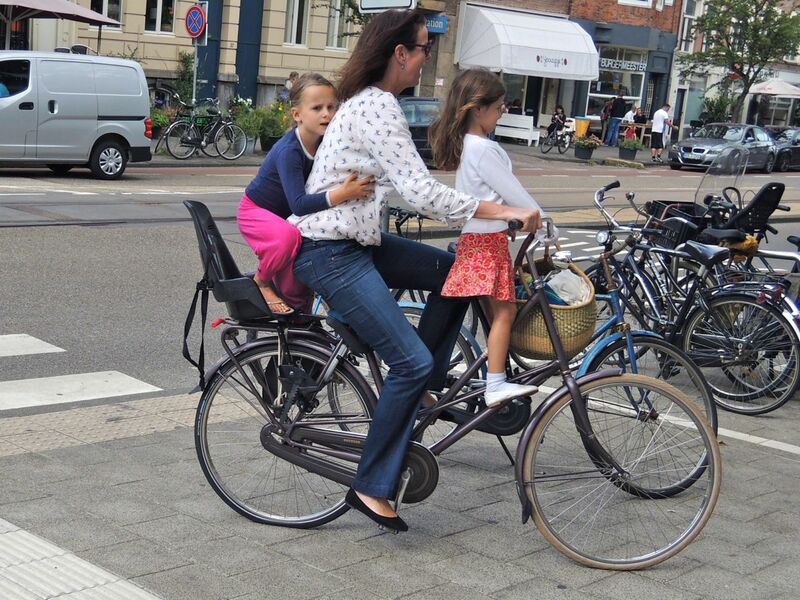 No helmet, no child seat: no problem. 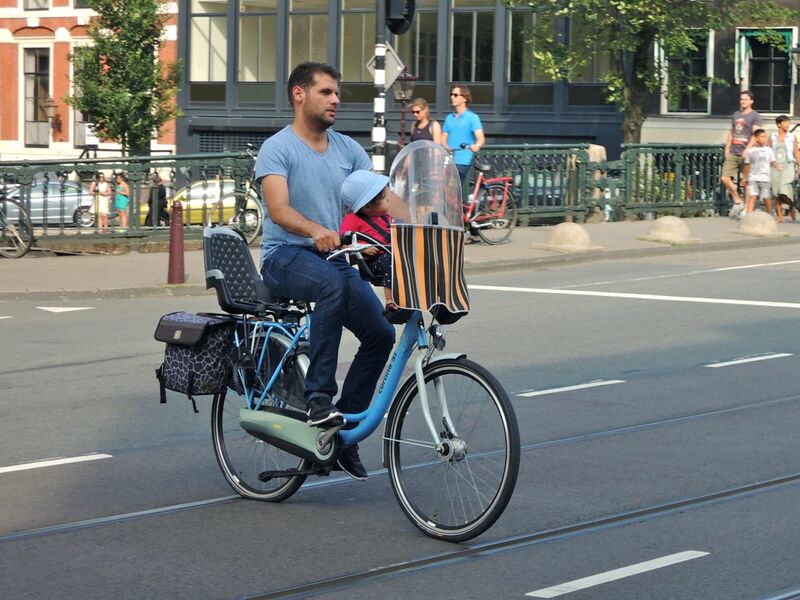 One true sign of success in Amsterdam is that women do the same thing. 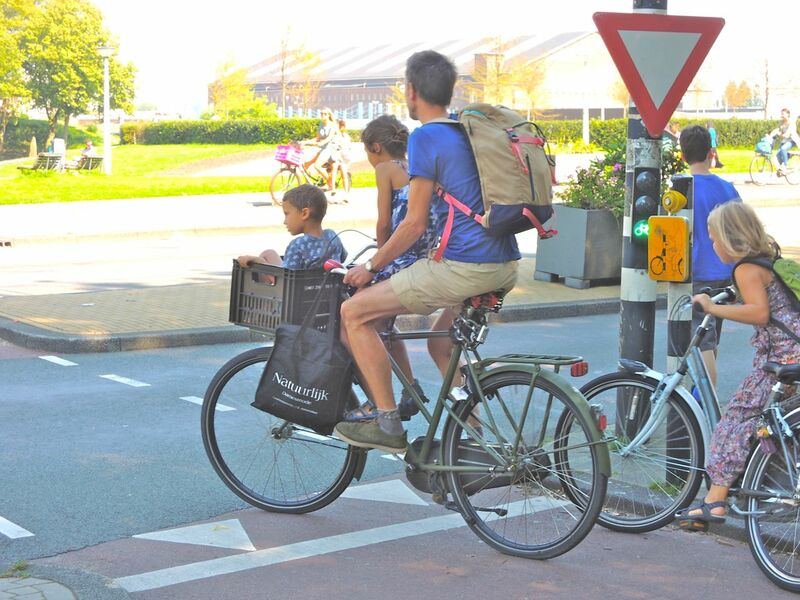 When you’ve created a system where women and children feel safe, where riding a bike doesn’t feel like a risk, you’ve earned a winning score on the bike-o-meter. I stayed across the street from a school and my whole family enjoyed watching the different transportation strategies families employed to get there. 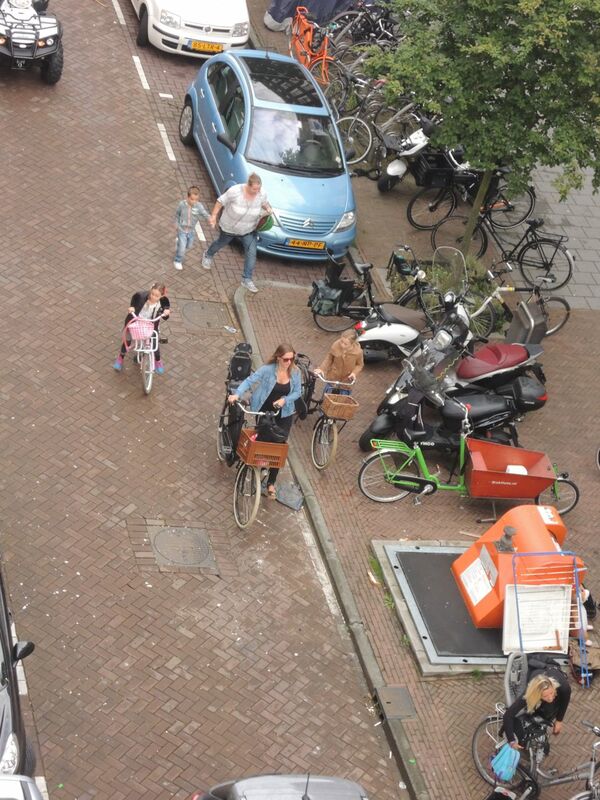 How many different modes of transport can you see here? A friend once said that when the only tool you have is a hammer, the whole world starts to look like a nail. When the only transportation option you have is a car, you may be tempted to drive everywhere. Reminds me of riding in the trunk of a station wagon. 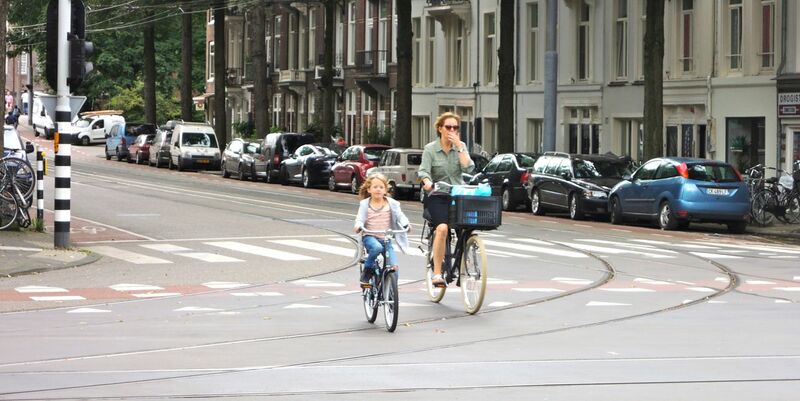 But the combination of thoughtful facilities, functional bikes, and an accepting attitude encourage all sort of people to feel safe cycling (or riding a train, walking, or using a bus). I love the way comfort is worked into the function of these bikes. Notice the wind shield and skirt for the baby seat in the front. I can’t wait for women and children to be on board, riding the streets of America too. Good series Bruce. We have a ways to go. And as long as fuel prices stay low it’s hard to convince Americans to get out of their cars. That’s for sure, though we’re making some progress here in Portland, New York, and Minneapolis to name a few places. And this is the end of the series for now. Back to boats, food, and other adventures next! I’m dreaming of a skin-on frame boat (Peapod?) that I can set up to pull behind my bike, but also fit the bike in when I go rowing, or maybe even camp cruising. Dreaming is good. Where will you sail her? Port Townsend area, mostly. I already built a Welsford Rogue that I have been rowing and camp cruising in, but there are some spots I’d like to be able to launch that don’t have boat ramps and also I would love to be less dependant on gasoline to get to the water. Also during fishing season there is a huge line at the launch ramp. it would be nice to bypass that! I’m thinking laminated spruce or cedar frames with cedar stringers and a 2 inch or so keel down the center outside the skin so I can put a little sprit sail on it and not just sail straight downwind. Mostly a row boat though. A spot at each end for an oar for sculling or steering and an open space on the floorboards big enough to lay out a sleeping bag…The dream goes on!